See the Laws of Gravity Defied! We are located only 15 miles from the New River Gorge Bridge in Fayetteville, WV and 2 miles east of Hawks Nest State Park where you can ride the aerial tram and jetboat. 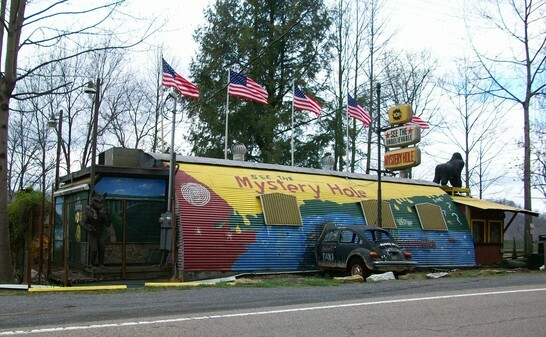 This mysterious mindbaffling Mystery Hole was unclosed for public view around the middle of the year 1973, and is probably the best kept secret in WEST VIRGINIA or maybe in the whole U.S.A., ...no one really knows for sure. Here the laws of gravity seem to have gone berserk and your sense of balance is entirely upset. To learn more about us, click any item on our menu. For hours of operation click on Hours/Contact Us. Thanks for visiting and be sure to check back often for updated informaton. Copyright © 2019 Mystery Hole. All Rights Reserved. This material or any other photos may not be reproduced in any form without permission from owners.